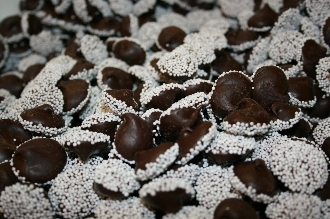 Nonpareils are best known as "snowcaps" and are a delicious crunchy candy that is addictive to many. They are handmade by us available in Milk chocolate, white chocolate, or dark chocolate. Specify which type of chocolate you prefer when ordering.